"Who will rid me of this foul monster? Who will rid me of this pernicious bandit, Gerulf?" Thus began an evening of roleplaying fun played off-the-cuff with some really rather surprising results. Recently we've been struggling to get the Friday Night Roleplay group together for a game. At first it was the erratic shift patterns of the various professionals who meet at our table - all of whom work uncanny hours. Last time it was my own pressures at work that led me to cancel. We've been working towards running an SF game too... but, although the players have kept up their end and created characters, it has been my own failure to prep that led to the situation last night. We had no game. We had a full house. What's a GM to do? Step One: Let everyone know that, altthough the expected game can't progress, you are ready to receive everyone who wants to come and roll some dice. Step Two: Choose an easy-to-pick-up game system and get ready to improvise. Step Three: Grab a random dungeon map, open a link to behindthename.com, think up a game premise (see the opening quotation), and ask everyone to bring some dice. Step Four: Give everyone a characterisation sheet and a character sheet; run the quickest creation sequence you can. Step Five: Run the opening scene and get the players moving. Mortenburg. The walled village was once a proud bastion at the edge of the Great Empire, but that was 700 years ago. Now it has become the home of poor cattle farmers who nestle at the foot of the Northreach Mountains, far from the comforts of what little civilisation survives under the less-than-tender care of the Barons. Meister Eckhart, the Watcher of the Keep, faces hard times. A cruel bandit chieftain has arisen in the mountains and demands tribute from the villagers lest they face his wrath. "Who will rid me of this foul monster? Who will rid me of this pernicious bandit, Gerulf? ", cried the Meister across the gathered crowd of villagers and travellers pressed within the village square. "I will go," boomed the voice of a tall man bearing the symbol of the Everlasting Light around his neck. That was the set-up. Funnily enough, and quite unintentionally, the session ran really smoothly. It also ran "Old School". 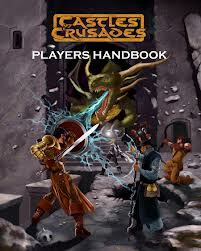 I chose to try out Castles & Crusades, the rules-lite D&D-derived fantasy system from Troll Lord Games. I've been eyeing the game for a trial for months, having collected all of the core books, and was excited about the opportunity to combine it with my improvisational skills. "You've got six attributes; one of them will be a Primary from your class. Primary attributes test against a base difficulty of 12 on a d20, while Secondary attributes test against a base of 18. Oh, and humans choose two other Primary stats while Demi-humans choose only one. Tests are d20 + Level + Attribute Bonus, roll high. Combat attacks are d20 + Bonus to Hit + either Strength or Dexterity versus AC." The second best thing about C&C is that the rules get out of the way of the game: I found myself describing actions far more than I would have using D&D3.x or 4e. The outcome was summed up by one of the players who, commenting at the close of the session, said that it was refreshing to both imagine the details of the action rather than the dice outcome... and that it was good to be making meaningful choices again. Old School relies on collaboration and imaginative application of a framework. It's "rulings not rules", to quote the master of the OSR, Matthew Finch. Don't roll against a "search skill"... ask them how they are going about that search and narrate what they find. Make 'em roll if there is a meaningful challenge involved, not because there's a stat they can roll against. As I narrated the tale, spinning the details out of the collective suggestions that players unwittingly drop through their own interactions, I found myself really relaxing and enjoying the scene. On the road the heroes came across a herd of cattle, partially blocking their way. I'd rolled off a random encounter table I'd pinched from some random module I'd printed off to read weeks ago... and it was "domestic herd". The players started to ask questions - "Where's the nearest farm?" (miles south of here); "Is there a herder visible?" (no); "Are they branded?" (yes, with a mark from a farm south of Mortenburg). They decided these cattle had been rustled and were a good clue for the bandits being nearby. As they dithered slightly about what to do with a lost herd, I decided to put them under pressure: "Three arrows whistle out of the crags around you; Gutwurt's been hit!" The combat ensued. When they finally spotted them, I described the archers as "short and wearing black hooded cloaks". They mentioned it must be some of the bandit Goblins. That worked for me... Gerhart staved his Great Ax through the head of one, causing the other two to panic. Four rounds later it was over. But the most interesting part of the encounter was the addition of a single robed figure on the opposite side of the mountain path. The figure was, for two rounds, inert and clearly watching. Jon, the assassin, spotted him first and decided to stalk him. I saw an opportunity. First the figure summoned some kind of witchery, prescribing two arcs in front of him and forming a pale blue line in the air that seemed to fade into a shimmering field of energy. Then he pointed at the charging Gutwurt and, shouting a command, sprang forth a bright blue dart which unerringly struck the poor fighter and smote him to unconsciousness. Having established the threat it was time to allow the assassin his glory. The player had clearly signalled that he wanted to stalk and kill this mage with his special ability. Gutwurt's player risked stealing this dramatic moment when he charged the figure... so he had to be the victim of the spell. When the moment came it was all the sweeter: Jon the Assassin aimed and released his arrow, piercing the back of the unsuspecting mage, and killed him in one single strike. The table cheered. The grins were infectious. Everyone nodded... except Gutwurt's player. But they found him a vial of green liquid which, once they risked using it, proved to have healing properties. A night in a cave to rest and all were ready for the adventure proper. The evening was running towards an end so I allowed the players to address the question of how they could enter the cave. They searched the tower, in hope of a secret underway into the cave complex they imagined beyond; they also suggested that, not having excavation gear (like a spade), they wouldn't be able to dig under the rubble and accumulated silt to find it. In the end, utilising the assassin's sneaking and the ranger's rock climbing abilities they hatched a plan to ambush the sentries in the cave. This was another moment for two heroes to shine, so we went with it. A graphic, short and brutal struggle against two Goblins was played out... ending with the ranger, Karl, knocking the surviving bandit to the ground, pinning his weapon arm under a boot while slitting it's throat with a dagger. From there we entered the dungeon where, from a steady and stealthy entry, early scouting indicated a banquet hall feeding some 15 or so Goblin warriors. The evening ended with the decision to try the "narrow passage" and see if they can bypass the rather odd door blocking access to what might be a backway. Forced improvisation. Clearly, I now realise, I GM better when I don't have much to work with. Instead of ruffling through notes looking for the next description or detail, I spent my evening listening to and engaging with the players. I used their ideas as much as my own. We all had fun. Low-level Rules. C&C is easy to run. Yes, I did some page flipping to check three things (spell descriptions, damage and healing rules, and double-checking the assassin's abilities), but it was actually unobtrusive and only necessary because I was running things for the very first time. Fewer rules leads to more description and better quality roleplay. Stolen Details. I stole a dungeon map. I nicked some Goblin stats from a module. I ransacked the player's suggestions. Putting it together, we created our own tale of adventure. It felt good too. Willing Players. The guys wanted to play. They wanted a good night. They went with the flow. They didn't moan about yet another character creation phase, or a change of system, or me letting them down with the planned game. They ran with it. They excelled. They made me laugh out loud with their enthusiastic play. Good Advice. The accumulated wisdom of several good GMs paid off for me. There's Jamison's guidance first. Added to that was a remembered comment from Matthew Finch about placing a time limit on the adventure and his quote, "rulings not rules". There's the advice given in Castles & Crusades about running the game. And the thoughts and advice from commentators here and on other blogs, especially Blood of Prokopius. Thanks are due to every one of these people. In the end, we took a risk... and it paid off. I actually want to finish this adventure. And I can see me plotting to develop it too. The crazy half-baked RPG ideas that fill up my head.